One of my favorite things about springtime in southern California is when all the flowers start to bloom! We may be in the midst of a drought, but luckily most of Los Angeles is covered in plants that are accustom to a more arid climate, like the beautiful pink bougainvilleas! They only bloom for a short period of time, but they are so gorgeous. And, lucky for me, the fences of our parking lot are covered with them! Naturally, I had to use them as a backdrop. 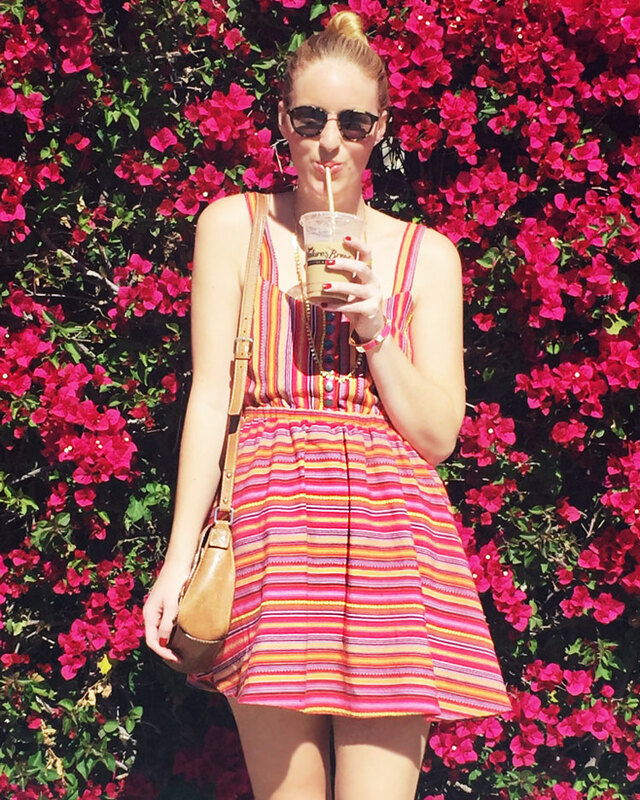 It's been seriously lovely these past couple of days, total sundresses and iced coffee vibes. 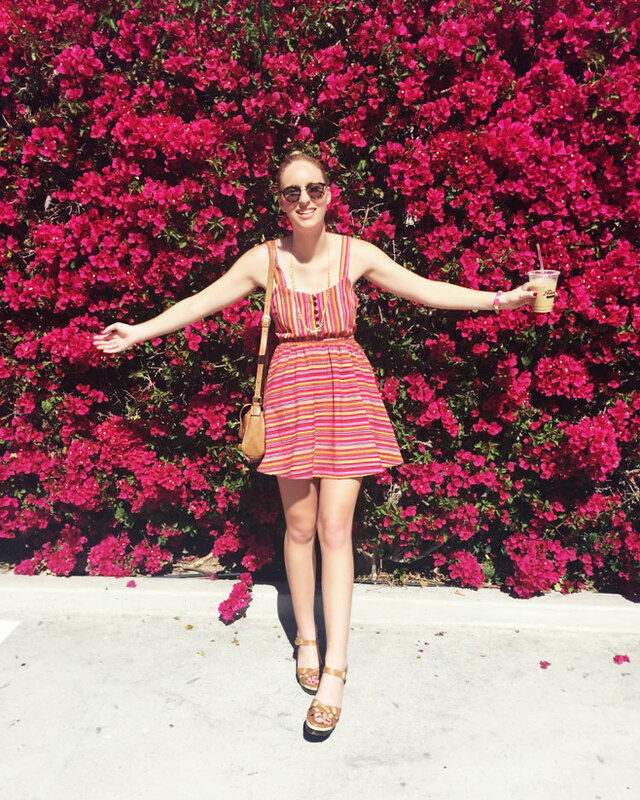 I thought it would be fun to pose in this Mexican woven dress from Urban Outfitters against the flowers, plus pink on pink is always a winning combination. The great thing about this dress is because it's a bold print in a bright color, you really don't need much else. 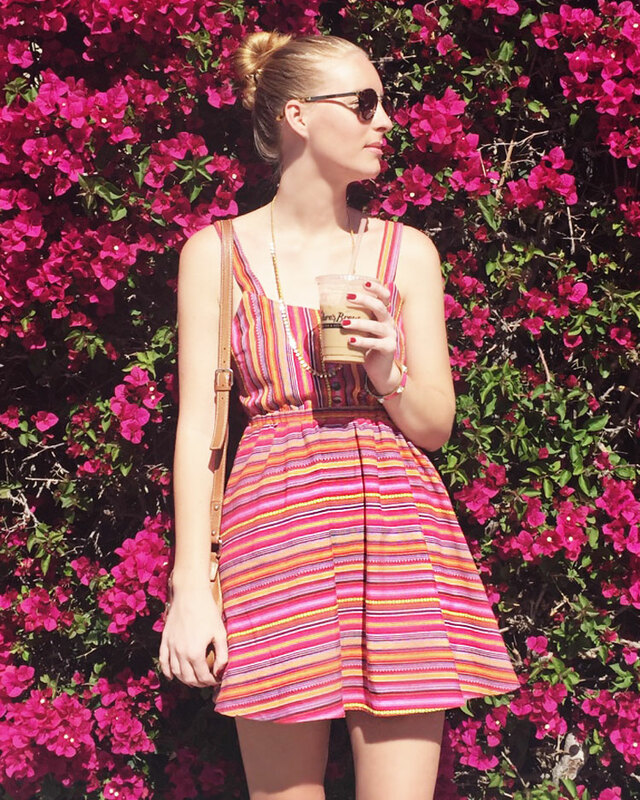 I love printed sundresses for gorgeous days like this one; they're an easy one-and-done outfit! And while this particular one is a few years old (Hannah wore it in season one of Girls, though I'd venture to say that I wore it better) I've selected some current printed dress faves of mine below. What's your favorite thing about springtime? Tell me in the comments! I want these roses. I love flowers so much and I want to just stand there and stare. Your dress is so cute. love your updo, it is just perfect with your dress. Yes, the flowers are so pretty! It makes me so happy whenever I go into our parking lot, which is usually so bland haha! Thanks, Esraa! This is such a gorgeous look.....i love the dress! Love the dress! I love the vibrant colors together and the back... yes the back is gorgeous!